On our final day driving west on this trip, we left the hotel just after 8 a.m. and headed to Coronado Island on CA-75 to scoop up a few ounces of the Pacific Ocean. To reach the island, we crossed the landmark Coronado Bridge. 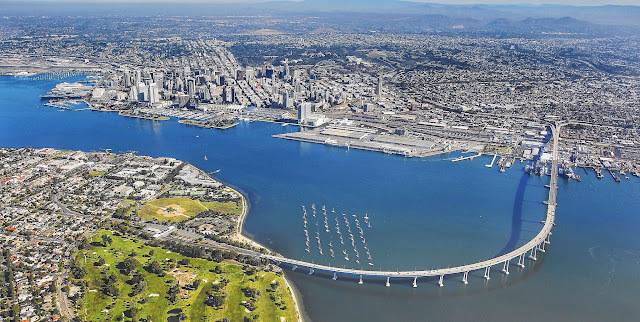 With its elevated deck and lengthy curving span, the bridge offers a terrific view of both the island and downtown San Diego. Talk of a bridge spanning the bay from San Diego to the resort town of Coronado began in the 1920s. For some time, the Navy, which has long operated a major base on Coronado, opposed the construction, finally agreeing to support the project if it permitted at least 200 feet of clearance for its ships to pass underneath. To achieve that height while maintaining a reasonable grade to access the bridge, engineers increased the length by incorporating a swooping curve into the design. The two-mile bridge opened in 1969 on the occasion of San Diego's 200th anniversary. 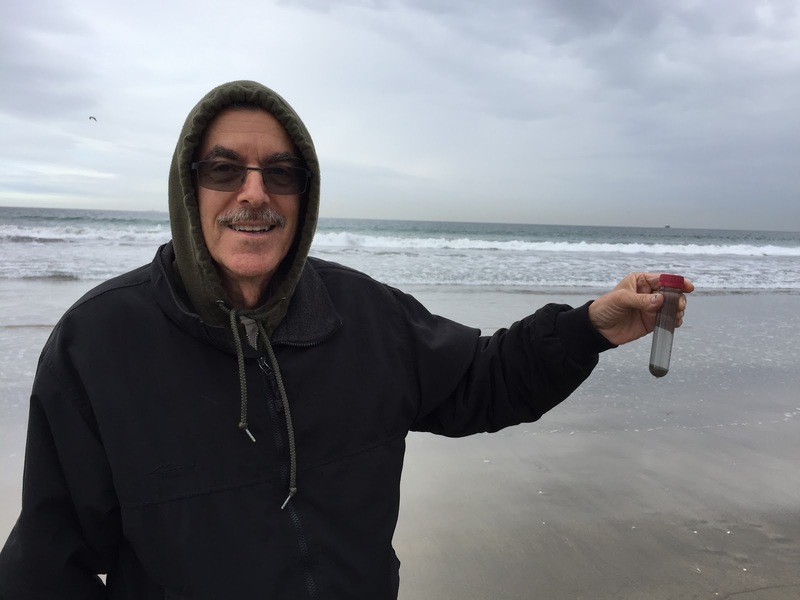 Silver Strand State Beach on Coronado's western shore offered easy access to the Pacific Ocean to obtain our water sample, as we continue to ponder what we'll do with this growing collection. At this point we could go west no further, so we turned back east with plenty of time to consider what to do with the water as we began our long journey back to Georgia. We followed I-8 as far as Alpine, where we turned north on CA-79 to move up to I-10. Yes, we are driving on some interstate highways in California because we've not driven these particular sections of I-10 before. Just about lunch time we reached the quaint mountain town of Julian (pop. 1,502). With its elevation above 4,000 feet, the town is often decorated with winter snow, making it a popular day trip destination for residents of SoCal. Even though it was a weekday, the streets and sidewalks of Julian were busy with tourists today. Parking was at a premium, but a bit of trolling rewarded us with a just-vacated space directly across Main Street from Soups and Such Cafe. There we enjoyed a warming bowl of hearty vegetable soup and prepared to order up some apple pie. After all, we were in Julian, the town that claims to serve the world's best apple pie. 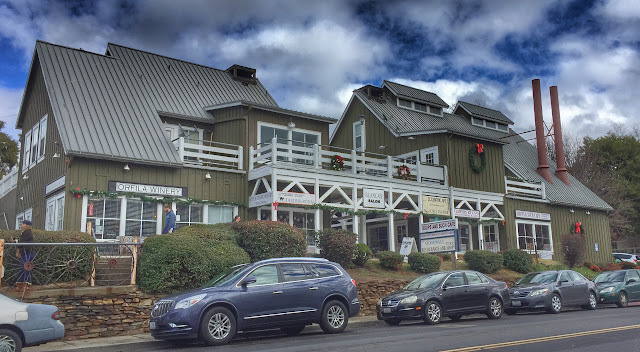 Once a frontier town fueled by a minor gold rush, Julian is now better known for its apple and tourists industries, a pair that go hand-in-hand. That same cold-winter climate that attracts tourists also proved ideal for growing apples, and all of Julian's apples are sold locally, often in the form of pies. But alas, none are served at Soups and Such. So off we went to the Julian Cafe and Bakery, where we claimed the last empty table, our tastebuds tingling in anticipation of a super special apple pie. After all, the restaurant serves a BLA sandwich and all manner of other dishes featuring local apples. We figured they were experts. YOU CAN DO BETTER, JULIAN CAFE! Sad to say, we were in for a big disappointment. 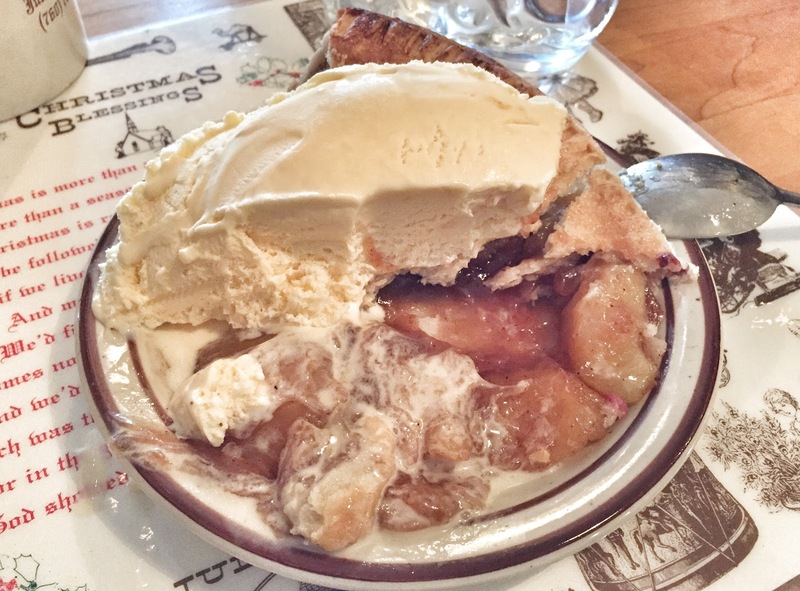 Our Julian apple pie à la mode turned out to be a tasteless, cold slab of pie topped with a huge glob of ice cream. The single-serving frozen pies we bought at the grocery store 40 years ago were far superior. Not cool, Julian Cafe. We left most on the plate and slinked out of town. From Julian, we turned east on CA-78 through the Anza Borrego Desert State Park. At 600,000 acres, the park covers one-fifth of the large San Diego County, itself twice the size of Delaware. 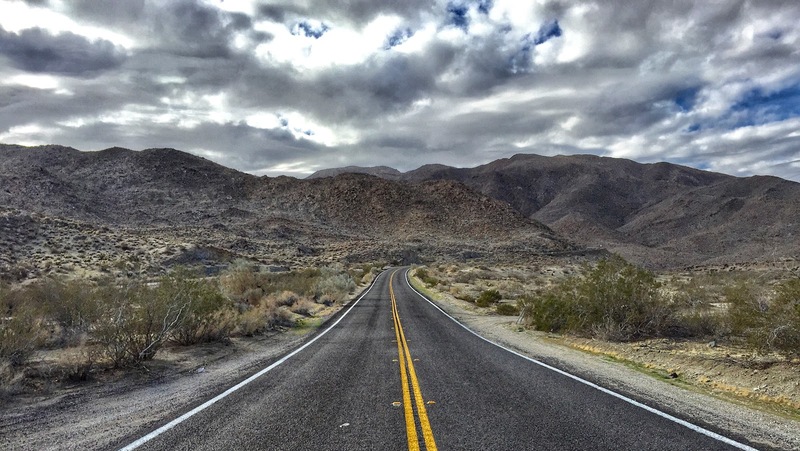 Extending about 25 miles east-west and 50 miles north-south, Anza Borrego, a subsection of the Colorado Desert, is California's largest state park and, behind New York's Adirondack Park, the second most extensive state park in the continental U.S. 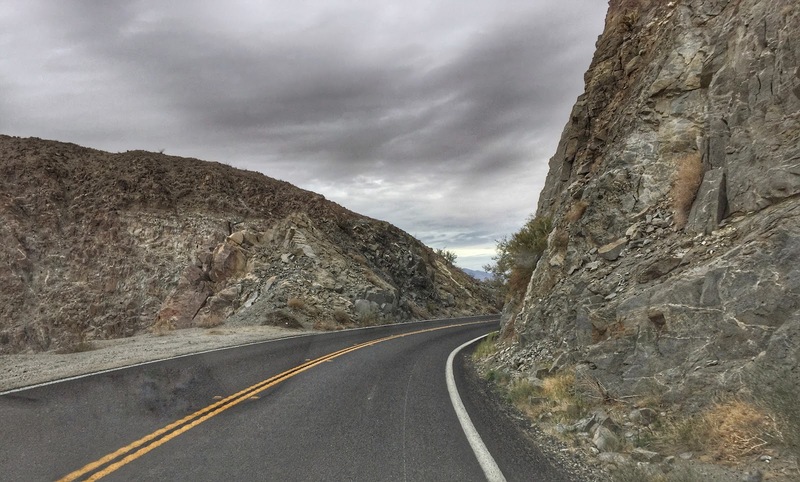 It came as no surprise to learn that this section of CA-78 has been designated a scenic highway, offering up one spectacular vista after another. 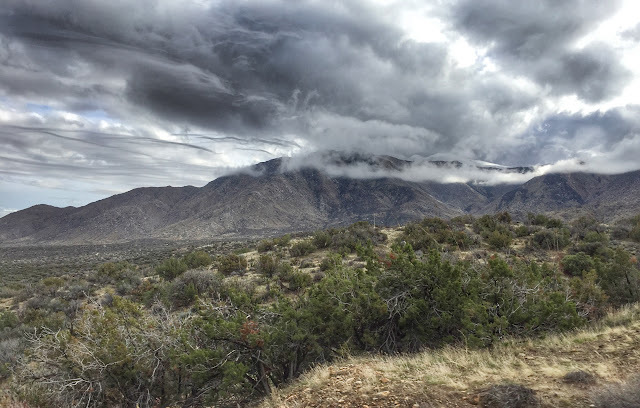 From Julian through the ghost town of Banner, the area was completely uninhabited except by desert dwellers such as bighorn sheep, mountain lions and jack rabbits, none of whom crossed our path today. 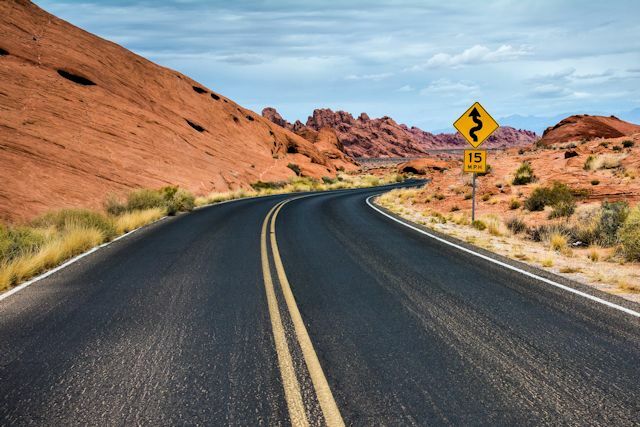 Once we were through the mountains and exited the park, we drove through sandy desert flatlands as the road approached an intersection with CA-86 near the Salton Sea. TODAY'S CLOUDS PUT ON A SHOW TO COMPLEMENT THE SCENERY. After turning north on 86, we stumbled across an odd ghost town called Salton City. In 1905, the Colorado River, swelled by floodwaters, breached its levees in southern California and flooded a desert valley known as the Salton Sink. 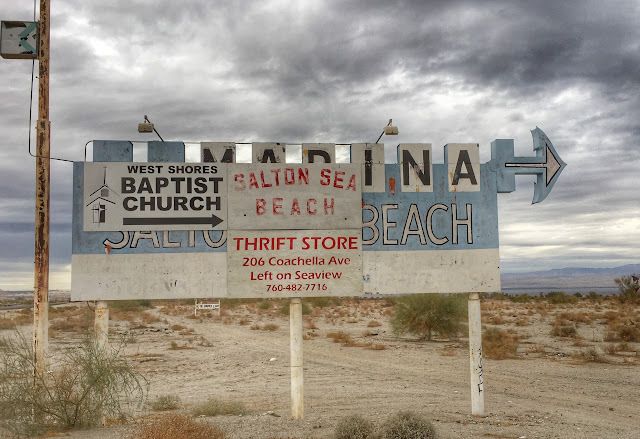 For two years, the water flowed into the valley, creating the largest lake in California, which became known as the Salton Sea. Birds flocked to the area, and fish thrived in the 15- by 35-mile lake. 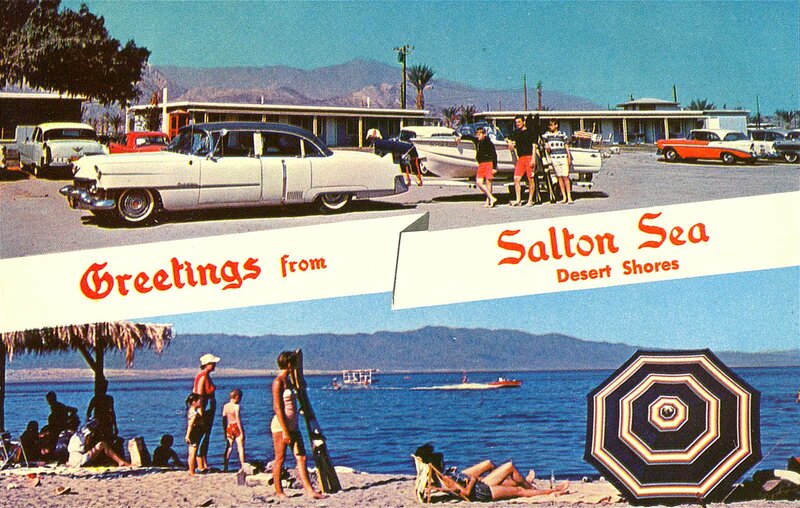 Of course, developers weren't far behind, branding the area the "Salton Riviera." People flocked to the area as hotels, yacht clubs, homes, and schools were built along its shores. No one paused to consider how this lake in the middle of a desert with virtually no annual rainfall could be sustained. The unfortunate and inadvertent answer was irrigation runoff. 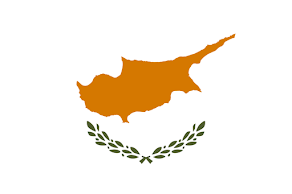 Of course, that water was polluted with pesticides and fertilizer. With no drainage outlet, the lake became more and more poisoned until its shores were littered with the skeletons of dead fish. A PALTRY FEW RESIDENTS AND A FEW BUSINESSES HANG ON AMIDST THE POLLUTION. What was once a lush oasis, a haven for resort lovers, today stands eerily silent, littered with abandoned homes, boats, and beaches. Driving through the town evokes an odd other-worldly, post-apocalyptic feeling—until one comes across a still-occupied house or two and wonders how people could continue to live there. At best, it would have to be depressing to live in such an environment. At worst, extremely unhealthy. 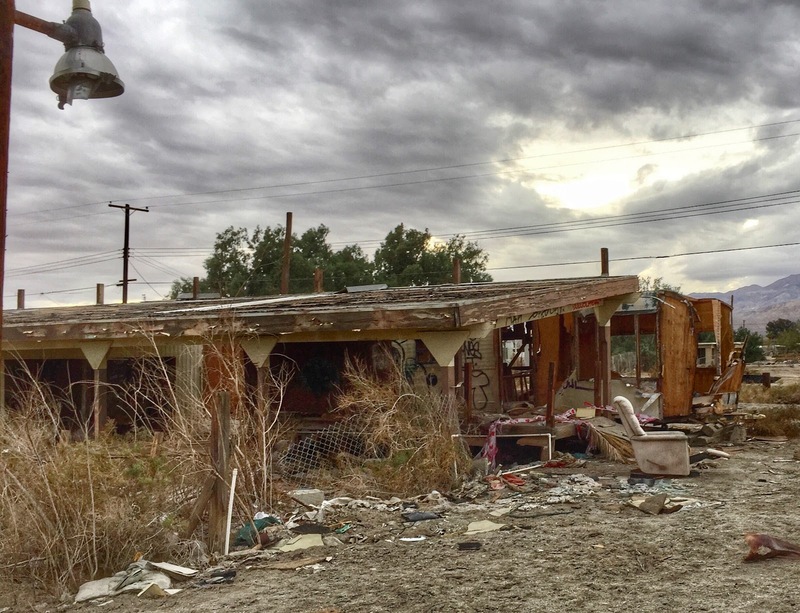 But we were just passing through, and once we shuddered our way through town, we continued north on CA-86 and felt refreshed when a cleansing rain began to fall just a few miles from our destination for the night at La Quinta, CA. Tomorrow we'll continue on our journey eastward with no set plans about where we'll end the day. 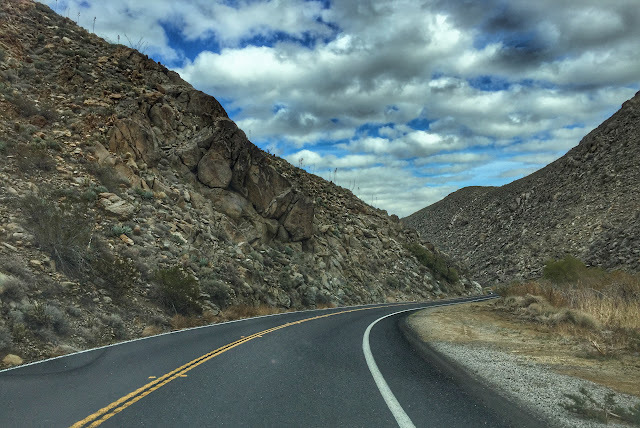 Loved: Our favorite part of the day was certainly the ever-changing array of scenic vistas as we drove through Anza Borrego Desert State Park. We had seen the southern edge of this park on our way west and sensed that it had much more to offer. It certainly did. Lacking: Good apple pie in Julian. 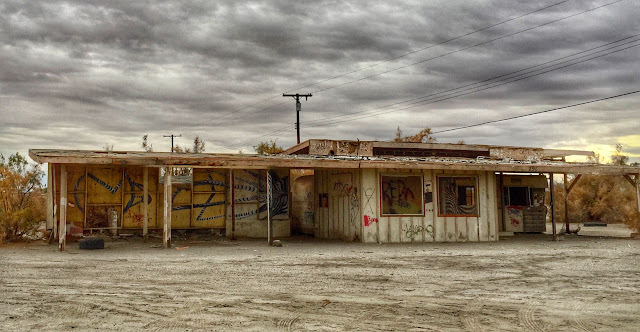 People in Salton City. Learned: The folly of believing in desert miracles.